Everyone wants to succeed. No one sets a goal to fail but sometimes obstacles get in the way of our progress. However, obstacles need only slow our progress— they don't have to mean failure. 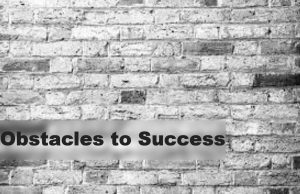 Here, then, are 7 obstacles to success and suggestions for overcoming their challenges. More than 90% of people have identified lack of focus as their biggest obstacle to success. Does this describe you? You jump around from one project to another. You have one hundred half-finished projects lying around. You're confused and wonder why success seems to evade you. Soon you give up believing the goal was unrealistic in the first place. You need to learn self-discipline. The first thing you want to do decide exactly what your objective is. The next thing is to weed out all of the unfinished projects that will not assist you in achieving your goal. Prioritize your tasks and finish it before moving to another. If you find yourself drifting, you need to stop and remind yourself of what you are attempting to accomplish and why. You may want to set aside an hour or two each day to focus on the project at hand. Tackle the hardest tasks first. Then move on to the easier ones. Every successful person has developed the habit of self-discipline and focus. By focusing on one project at a time your success will be just a matter of time. Related: End Procrastination: Eat that Frog! You are a perfectionist. You finish your project, but you don't think it's quite right. Then, you tweak it a little, and begin to wonder what else isn't right. You don't want to put it out there until you are sure it is perfect. You need to learn to take a risk. Put it out there, it's just fine. Nothing is ever perfect. There's always room for improvement. You have no way of knowing which improvements are needed until you put it out there for the world to see. Once it's out there get to work on your next project. Many people believe the saying “It takes money to make money”. While this may be true to an extent, it is an obstacle that can be easily overcome because if you truly desire something you can always find the money. It may be a matter of skipping a night out on the town or brown bagging it to work. Most people can find a lot of money that they squander on wants each month instead of needs. You have to ask yourself what you want more. If you have a great idea and need more money than you have – You may be able to get a loan or by doing some investigating you could be fortunate enough to find an investor for your project. Related: How Much Does it Cost to Start an Online Business? You've probably heard the term, “Fear of Success”. If that's the way you feel, there's usually an underlying reason. Do you think that if you succeed you'll have more responsibility than you can handle? Do you feel unworthy of success? Or, maybe you believe the lie your parents told you … “You will never amount to anything”? Are you afraid your significant other or a loved one won't love you as much if you succeed? That they will envy you and turn on you? Maybe even leave? Are you afraid of criticism if you fail? Or are you simply afraid of the unknown – How will success change your life? Before you can overcome fear, you need to figure out exactly what you are afraid of. Often times once you realize exactly what your fear is, it dissipates. You need to learn to be confident in your decisions. Accept that you are not perfect but you are worthy of success. You have something of value to offer the world. Visualize what life will be like when you succeed. Everyone is allotted the same amount of time, 24 hours a day, and 365 days a year. It's your choice how you spend your time. I often find lack of time is more of an excuse not to do something that you may not really want to do. Everyone seems to find the time to do things they enjoy. By dedicating just an hour a day towards your goals – you will achieve them. Just about anyone can find an hour a day to focus on something that is important to them. For good time management skills you need to: Make and follow a Daily to-do list, Prioritize, Clear away physical and mental clutter, Delegate whenever possible and Learn to say NO. Don't waste your precious time doing something you don't want to do just so you don't hurt someone's feelings. This could be an inner conflict within yourself, a conflict with your significant other or a business partner. To be successful you need to follow your passion. Your goals need to be personal. It must be something you desire with all of your heart, mind, and soul. You can't try to do something that goes against your personal ethics and morals. You will be in constant distress and will lack the motivation to do anything. If your vision conflicts with your spouse or significant other – then you should rethink it. Find a compromise. If your conflict is with a business partner, it may be easier to go your separate ways. Don't allow distractions to get in the way of you achieving your dreams. Distractions are just a form of procrastination. Distractions can be anything from getting up for a cup of coffee, taking the kids to school, talking on the phone or watching TV. If you're working on the internet, it's easy to get caught up going to this site – or that one. To read blogs, post comments, watch YouTube … and the list goes on. When distractions arise, you need to remind yourself what you are trying to accomplish and then FOCUS. Bottom Line: Decide what you want to accomplish. Be sure it's something you are passionate about and that it aligns with your beliefs and values. Set aside a certain time of day to focus on achieving your objective. To be successful you need to develop your focus, be persistent and remain positive. My biggest obstacle is getting distracted lol…..like how I stopped to read this article! Although it helped me a great deal, I am distracted from doing what I intended to do lol. What great timing! Lack of focus describes me to a tee. I have one major project that I have been working on but tend to constantly get sidetracked (I have a lot of interests!). Focussing in on my main project which I think can be very successful is what I need to do and this article just reinforces that. Sometimes we just need to be reminded what to do. Thank you for the post. Helped me! I have found my biggest obstacle is time. I sometimes end late with my works maybe because I don’t know how to manage my time and how to prioritize my work. This article is a big help to me especially in managing time. So I better need to do a Daily to-do list and Prioritize my work so I’m not gonna get very tired at the end of the day. I have to agree these are the biggest obstacles because they all lead to confusion that on its turn leads to failure. In 2006 I tried affiliate marketing and failed within 3 months because I started trying to promote hosting companies and a whole bunch other products that are totally unrelated. It cost my time and effort and brought me a great deal of anxiety. Let alone my money. I agree. . .FOCUS before anything else! Lack of Money is really true. Sometimes if we have extra income we forgot to save, instead we spend this for our wants rather than needs. Time is very important as well, we should give time for work, relaxation and with our family. Our health is very important. Spending almost 24 hours of work is not good. Yep those are definitely some of the biggest obstacles to success. I think another big one is patience. Most people want everything so quickly and when it doesn’t come they give up. You aren’t going to get rich overnight so you must be ready to focus for the long run. One thing I have learned online – You only have 24 hours. I once tried to work overtime everyday to rush my success and it cost me my health! Then I realized how important time management can be! Only focus and keep away from distraction will help you grow, focus on doing more works from the same time, not using more time to do the same work!